Cut the potatoes into chunky chips, put in a pan of salted water and bring to the boil. Simmer for 5 minutes or until slightly softened, then drain and steam-dry in the pot for a few minutes. Pour 3 tbsp of the oil into a shallow baking tray and heat in the oven for 5 minutes. Toss the chips with the paprika, cayenne pepper and some salt. Tip the chips into the hot oil and bake for 40 minutes, tossing halfway through. Before the chips are ready, cook the gammon slices on the barbecue or on a griddle pan. Use the last bit of oil to fry the eggs. 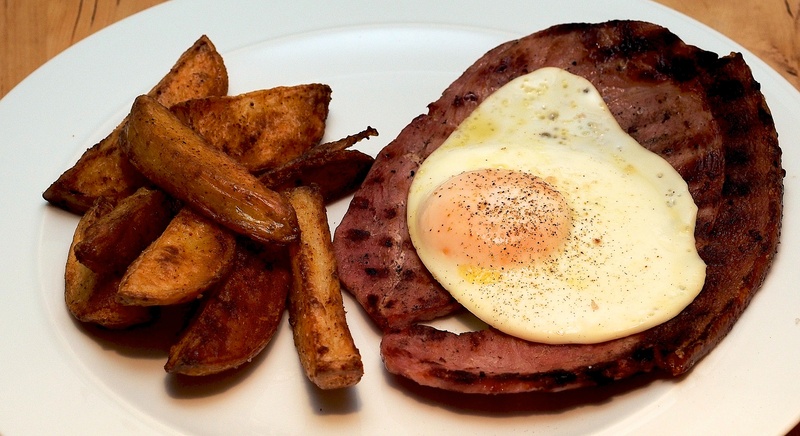 Serve the gammon steaks with an egg on top and some chips on the side. Wine Suggestion: We probably wouldn’t have wine with this but if you’re in the mood you could try a light red that’s been slightly chilled. I haven’t had gammon steak in ages, you have reminded me how good it tastes.